We have two returnees from last week and three debutantes in this week’s super starting five – two of which were history makers! There is no stopping Leicester Riders right now and that is largely due to the driving force of their team – aka Winterburn. The guard has been the centrepiece of a their winning streak which has not seen them defeated since their opener at Suns. Their most recent success was a derby demolition of Nottingham Wildcats, with the jewel in their crown leading the way by dropping 24 points, 6 rebounds and 5 assists. Our first debutante is the experienced Wagstaff, who showed exactly why her return to Archers has been so precious. She helped the Welsh side double their league win tally for the season with a nerve-shredding and gripping overtime success at Durham. It was a case of ‘Captain Fantastic’ as she not only harvested a spectacular 36 points, 6 rebounds and 3 assists, but also netted every single one of Archers’ 11 points during the extra period. 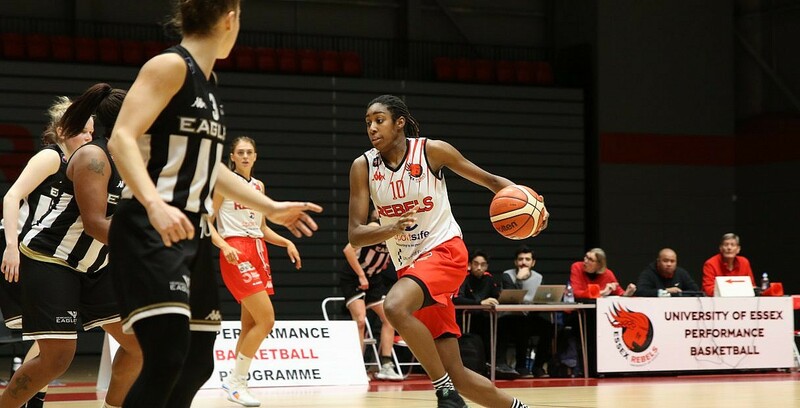 Our second debutante gets her first ever slot in our starting five and it was fitting that it came off the back of Essex Rebels claiming a first ever WBBL Championship triumph. It was one to remember for those present, since it came via an absorbing overtime success against the Eagles, with Ward recording a stunning 36 points, 7 rebounds and 7 steals – also shooting 11 of 18 from the field in the landmark victory. Having scooped the Molten WBBL Player of the Month gong for November, the arrival of December has not put the brakes on Ovner, who continues to shine in what is turning out to be an exciting and productive season so far for Mystics. The forward was at the heart of Manchester winning comfortably at Oaklands Wolves as she racked up another dazzling double-double of 25 points and 18 rebounds. Our final member of this week’s fab five is our third debutante and someone who was also central to that vibrant maiden success for Rebels. Waithe set her team on the way with some excellent early work in the game and continued to torment the Eagles throughout, as she eventually finished with a wonderful double-double of 32 points and 12 rebounds that will live long in the memory. History-making Rebels lead weekend takeaways!